Trust your insect pest control problems to Miller’s – your local bug hero! Has your home or business been invaded by some creepy, crawly freeloaders? Then it’s time to take action! Call Wollongong’s local bug hero for fast and safe extermination of any insect infestation. If you’re not sure what sort of pest is giving you grief, you can also check below for a quick profile of the most likely culprits! Cockroaches: These pesky, disease-carrying bugs are one of our most hated pests. 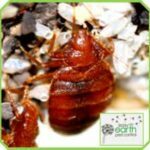 Read all about cockroach extermination and prevention on our Cockroach Control page. Termites: Termites (white ants) are a serious threat to any property they infest. We can help with a number of termite treatments including termiticide, bait stations and sub-floor ventilation. Get all the details on termite danger and management on our Termite Control page, or learn about the importance of regular Termite Inspections. Though they don’t carry diseases, ants are a nuisance because of their tendency to spoil food and deliver irritating bites. Ants travel widely in search of food, and multiply to alarming numbers quickly when they find a safe environment. These parasitic insects live in bedding, and feed on your blood during your sleep. Luckily their bites don’t transmit blood borne diseases, but they are often itchy and distressing. Bed bug leavings can also trigger asthma in sensitive individuals. As parasites, fleas bite humans and animals to feed on their blood. Flea bites can be intensely itchy, so secondary infection is quite common. They can in some cases also transmit dangerous diseases, including murine typhus, to humans. As pet owners know, flea infestation can also be extremely upsetting to furry friends. In addition to itchy bites, many pets suffer allergic reactions to flea saliva, leading to distressing skin conditions and incessant grooming. Fleas can also transmit a variety of parasites, including tapeworm larvae. Your pet will likely show you the first signs of a flea problem – and it will be the first to thank you for getting rid of them! Millers Pest Control has over 30 years of experience eradicating insect pests across the Wollongong region. We’re also fully licensed and certified to solve all your pesky pest problems – whatever your unwanted guests may be! Get your free quote on insect pest control today! Call Wollongong’s local bug hero on (02) 4276 4574 or 0430 634 503.